“Religious pluralism” means different things to different people. For some it means the ideological construct at the water cooler that there are “many different paths to God” and each one is equally valid. In this brief video from the One-Minute Apologist, William Lane Craig discusses “religious pluralism” in this context and effectively contrasts it with “religious particularism”. However, there is a more neutral understanding of “religious pluralism” in a cultural sense that I suggest might be more helpful as a prelude to doing Christian apologetics. While Dr. Craig gets to the crux of the issue with “religious pluralism” at a philosophical level, there is also a very human, day-to-day challenge presented by “religious pluralism”. If we step back for a moment, consider the fact that we live in a world where people with different faiths live next door to one another. We may not necessarily understand or agree with the religious beliefs or practices of our neighbor, but we can not deny that our neighbor exists and follows these beliefs and practices. Our curious neighbor shops in the same grocery store as we do. It is with this sense of “religious pluralism” that the term is being used in what follows from here. For several hundred years in America’s past, questions about “religious pluralism” were rarely seriously considered. Most people in American culture had some type of Judeo-Christian background. But over the last few decades, this is no longer the case. Countries that were once closed to Christian missionaries are now sending their young people to American universities for advanced education. Refugees and immigrants have come to the United States bringing their non-Christian faiths with them. The woman from Thailand at the dry cleaners may give you change for pressing your shirt while you glance at the Buddha-framed calendar on the wall. You learn that your doctor is from Egypt while you overhear his staff discussing the Muslim fast of Ramadan during your annual physical checkup. And don’t forget…. that lady in the computer call center you talked to last night with your PC problem? 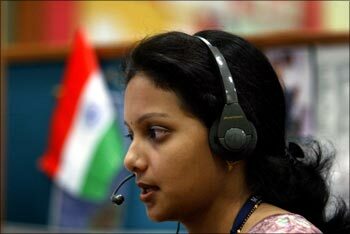 She is from India, just coming to work after visiting her local Hindu temple. Religious pluralism in the cultural sense is here, and it appears that it is here to stay. “Computer technical support. How may I help you today?” There are probably more religious options and concepts of “God” available today in our global world than there are ways you can break your computer. However, perhaps there is a better way of framing the question. One approach to consider is this: assuming that the Christian faith claim is true, how does the message of the Gospel account for compelling examples of piety in the lives of non-believers? This is where a theology of common grace and saving grace can probably help us. The idea of common grace is really rather simple. If “grace” is simply “God’s unmerited favor” towards us as humans, then common grace is God’s grace that is common to all people. God gives good gifts to people, even though they may or may not recognize who the Giver is. This is one reason why we can see noble characteristics of biblical piety, such as compassion, empathy, etc., even among those who do not embrace the message of the Bible. The sun and the rain can be blessings and signs of grace to people, but God’s Word makes it clear that the Lord “causes His sun to rise on the evil and the good, and sends rain on the righteous and the unrighteous” alike (Matthew 5:45). Every good gift we receive, whether as a believer or non-believer, is a sign of God’s common grace to all humanity. Consider the parable of the Good Samaritan (Luke 10:25-37). Samaritans in Jesus’ day were theologically suspect. They were the “unrighteous” ones. The Samaritans had permitted religious inter-marriage, contrary to the marriage purity standards of most Jews in Jesus’ day. They even established a different temple for worship at Mount Gerizim, as opposed to the temple in Jerusalem. Nevertheless, Jesus affirmed the merciful behavior of the Samaritan who helped the robbery victim on the side of the road in contrast to the indifference of the religious establishment. Clearly, Jesus’ point is that a “theologically-correct” Christian has no “lock” on Christian virtue. However, common grace should be distinguished from saving grace. Saving grace is that favor that God bestows on people towards salvation. Saving grace implies having a relationship with Jesus Christ that leads to eternal life with God. Saving grace keeps us from being eternally lost and separated from God forever. So while common grace is something that is shared in varying degrees by all people in this life, saving grace is different. The debate over how extensive God’s saving grace is towards humanity and how this saving grace is appropriated and experienced by individual people is beyond the range of this blog post, but suffice to say that the very essence of all grace, particularly saving grace, is ultimately a mystery that belongs in God’s Hands, and it can not be controlled or determined simply by human wishes or desires. So while common grace is something that can be detected in someone’s life with at least some modest level of confidence, detecting saving grace by us as humans is much more difficult because it requires an eternal perspective that only God has. So while we may have glimpses of the outworking of grace along our spiritual journey, in the final analysis God’s grace is something only known and revealed fully by God Himself. For the Lord sees not as man sees: man looks on the outward appearance, but the Lord looks on the heart. (I Samuel 16:7). This cartoonist understands the problem. It is very difficult to address the challenge of religious pluralism without coming across to others as being arrogant. Humility is often in short supply. Critics of Christian “exclusivism” argue that Christian faith promotes a haughty form of arrogance. One has the “truth”, while the other person lacks it. My religion can beat up your religion. To the extent that a misinformed Christian perpetuates such arrogance, repentance is absolutely necessary. But from the perspective of Scripture, it is anyone who thinks they have an inside track on the mind of God who are the truly arrogant. “For who has known the mind of the Lord, or who has been his counselor?” (Romans 11:34). Simply put, the Bible warns us not to be presumptuous as to how and to whom God dispenses his grace. 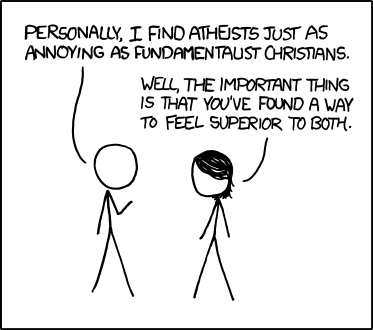 This applies to the Christian but it also applies to the critic of Christian exclusivism, too. Jesus Himself cautions us not to be flippant about how we describe the outworking of God’s graciousness. When Jesus was called a “good teacher”, Jesus responded with a wake-up call, “Why do you call me good? No one is good except God alone” (Mark 10:18). Among other things, Jesus is warning us that while we might be impressed with someone’s outward piety, there could be things going on inside that person at an eternal level that we know nothing about. When applied to the discussion of religious pluralism, we can see how the concept of common grace may be worked out. For example, a non-Christian religious tradition may emphasize the practice of meditation, which is something many Christians practice, too. A different religious tradition may uphold almsgiving as a virtue, which is consistent with a Christian virtue of having compassion on the poor. A different faith may honor many of the same ethical commands and ideals honored in the Christian Bible. In other words, Christians can and should affirm certain beliefs or practices that people outside of the Christian faith may have as good and gracious things to be celebrated. It should be noted, however, that the concept of common grace is not uncontroversial. Some are quick to point out that outward indicators of piety can indeed be counterfeit from God’s point of view. In Isaiah 64:6 the prophet laments that “all of us have become like one who is unclean, and all our righteous acts are like filthy rags“. Critics argue that any form of “righteous” living unconnected from saving grace is no more than a deception at best. Goodness in other religious traditions make look “good” on the outside, but they are no more than “filthy rags” in camouflage. Outward good can be a cloak to cover up an insidious evil. If we do not make a careful distinction between common grace and saving grace, we risk losing the effectiveness of Christian witness in the face of a religiously plural world. Let us guard against the pressures of culture to confuse the Truth of Grace. Other critics continue on by saying that any endorsement of common grace theology is simply a trojan horse argument for diluting the purity of God’s saving grace. Such critics contend that the only type of grace is saving grace. Grace that does not save is no grace at all. Placing the Christian like a frog inside a kettle of the cool water of “common grace” may look attractive at first. 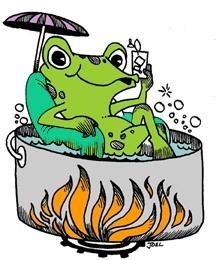 But slowly turn up the heat of pluralistic culture and the distinction between common and saving grace gets boiled away and the Christian, like the frog, gets cooked! There is an important warning here that must be heeded. Any theology of common grace based on the Bible requires spiritual discernment when applying it. I would agree. But the difficulty with these type of criticisms is that while it is surely wrong to call something that which is “evil” as “good”, it is equally wrong to label something which is “good” as “evil.” The Christian apologist should be able with the Holy Spirit’s discernment to affirm the presence of goodness and piety wherever it maybe found. If something is truly an outworking of God’s grace, we dare not malign our Creator who freely gives His gifts. Let us be thankful for His common grace that He freely bestows to all people, even when many continue in revolt against Him. So the next time you are at the water cooler and someone expresses the view that “all religions teach basically the same things”, it might be helpful to first talk about any of those good things that Christians share in common with others. Such an approach can go a long way towards building bridges towards fruitful dialogue instead of just killing the conversation. Let us celebrate God’s common grace in our conversations with others. Jesus is the Living Water. Drink in the Truth. The irony here is that the more you begin to discuss the things shared in common the more you begin to discover where the real differences are, particularly as they relate to the things that are beyond the scope of common grace. And you do not need to be comparative religious studies major to do this. For example, consider asking this: when Jesus talks about the Way, the Truth and the Life, is this the same thing that a Buddhist or a Muslim or a Hindu means by “Way”, “Truth” and “Life”? Closer examination through these type of questions shows some very striking differences. Furthermore, if someone wants to go further and claim full tolerance of all religions, then we must learn to treat all religions with respect….. and this means respecting their differences as well as the commonalities. How do we live in a world with our deepest differences and conflicting truth claims? From there, it follows to identify what are the specific truth claims of the Christian faith. Are these truth claims unique and can they be validated or disproved? And finally, what is the relationship between these claims of the Christian Gospel and the millions and millions of others who may or may not know this Gospel? Alas, these are questions that require future blog posts to address in detail. While it is important for the Christian apologist to respond to the skeptical friend that the message of the Gospel is indeed uncompromising, the Gospel still gives an adequate explanation for why we see evidence of goodness among those who do not consider themselves as followers of Christ. Common grace can be a useful theological idea for positively appreciating the good things in non-Christian faiths without compromising the central uniqueness of the Gospel claims. 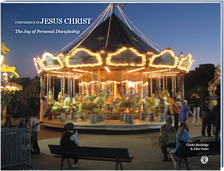 The subject of humility with respect to doing Christian apologetics is ably presented by John Stackhouse in Humble Apologetics: Defending the Faith Today. Stackhouse has followed in J.I. Packer’s position as a professor in theology at Regent College in Vancouver, British Columbia. Stackhouse argues that how we go about doing apologetics is just as important as what we wish to communicate in our apologetic conversations. Here is a brief interview with John Stackhouse explaining the need and purpose of his book. Highly recommended. Extra Credit for the Theology Geek: At a more scholarly level, the doctrine of common grace has had an up and down history. Detailed reflection on this doctrine began with Saint Augustine, and it was revived among the leaders of the Reformation, particularly John Calvin. In more recent times, common grace theology became an important feature of the Dutch Reformed tradition, led by Abraham Kuyper in the late 19th century. Kuyper served as the prime minister of the Netherlands between 1901 and 1905. Kuyper’s work proved controversial among some Dutch Calvinists, but it has since gained more interest as our world becomes more diverse, both secularly and religiously. A relatively brief book by Richard Mouw, President of Fuller Theological Seminary, He Shines in All That’s Fair: Culture and Common Grace explores the theology of common grace within the context of the Reformed theological tradition. This entry was posted on Thursday, November 8th, 2012 at 6:39 pm	and tagged with apologetics, Christianity, John 14, Religious Pluralism, theology, veracity and posted in Apologetics. You can follow any responses to this entry through the RSS 2.0 feed. Once again, out in front with some thought-provoking and well-researched material I’ve never thought about.. Outstanding! Thanks! Thank you for dialoguing with us on Veracity. I am not sure your proposal is all that new, as Raimundo Panikkar’s work on The Trinity and the Religious Experience of Man, which came out in the 1970’s, has pretty much the same themes, and I see that you cite him as a profound influence. I read Panikkar in the 1980’s, and while I was impressed with his desire to find some common bond between differing religious traditions with the aim of pursuing peace, I was not convinced that his approach took seriously the radical claims of the Christian faith. Assuming your approach owes much to Panikkar, it appears to possess a great deal of speculation that would not be well received by evangelical Christians, nor by perhaps even many conservative Hindus. It threatens to dissolve the unity between the different persons of the GodHead such that the Biblical portrait of the Divine becomes unrecognizable. I have not read Keith E. Johnson closely, but apparently he interacts extensively with Panikkar in his Rethinking the Trinity and Religious Pluralism: An Augustinian Assessment, giving a much more critical and scholarly critique that I can offer here. If you ever had the opportunity to review his work, I would enjoy to know your thoughts and reactions to it. In short, there is much to explore in Trinitarian theology, so it is great that you pursue this. I am just not sure that your method is going to be persuasive in view of the fundamental conflicting truth claims between Christianity and Hinduism. 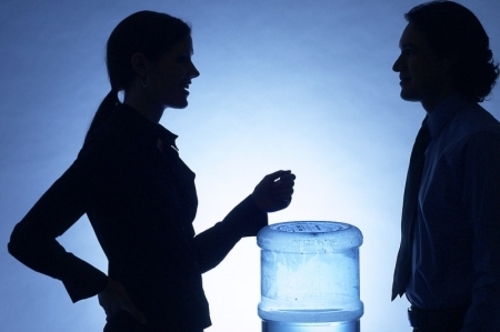 But let’s keep the conversation going, as it is really a vital topic in our increasingly pluralistic world. Clarke…. I’ve looked at a number of reviews of Johnson’s book, and recently had an exchange of e-mails with him. I sent him the following essay, but he didn’t bite. “Philo, St. Paul, St. John, Plotinus, and St. Augustine all saw a vital connection between the Old Testament figure of Adam and the New Testament Logos (Christ or World-Soul). “For Augustine (354-430), Adam is more than the first human; he is the source of all souls… the entire human race was in Adam, the Christianized World Soul, before he sinned; this is why we share his guilt… As we were all one in Adam, and ‘fell’ in Adam, so we are also all one in Christ (the second Adam), and in a sense Christ is ‘all of us’… It does appear that Augustine affirms that through Christ, the soul will rise above its original station… ascending to the higher part of the World Soul.” Farabi’s Virtuous City and the Plotinian World Soul – G. M. Bonelli, P.114/8 & 125. In the Bible, St. Paul tells us that as, “The first man Adam was made a living soul; the last Adam was made a quickening spirit (the Supreme Being)… The first man is of the earth, earthy: the second man is the Lord from heaven… And as we have borne the image of the earthy, we shall also bear the image of the heavenly.” 1 Cor. 15:45-49. According to St. Paul, union with Christ is union with God. “For as in Adam all die, even so in Christ shall all be made alive.” 1 Cor. 15:22. So at the second coming we are no longer “in Adam,” but then we are “in Christ,” and renewed creations linked with the life of Christ. The most important truth in Christianity is that we are made alive in Christ, signifying human souls becoming at one with God, without loss of individual self. It is said that in his epistles, St. Paul uses the expression “in Christ” and its various equivalents 165 times. Paul uses “in Christ” to characterize an all-inclusive personality, in whom believers find themselves incorporated in a communal union with Christ. It is a real connection, but not an absorption or obliteration. Being “in Christ” individually and communally is objective rather than subjective. It is not merely a metaphor or figure of speech, but a simple reality. Prayer, meditation, cosmic consciousness, samadhi, mukti, kensho, nirvana, etc., are all reputed to be channels of communication between the individual and the Almighty Allsoul. If God is “all in all” I Cor. 15:28, then all are one with God, or all are in God, but not necessarily all are God. This teaching has been called Panentheism. Like classical theism, panentheism resists the identification of God with the world. Rather, by saying that the world is “in” God, panentheism holds that God is more than the world. Panentheism agrees with pantheism in denying the idea – taught by classical theism – that the world is purely a contingent creation of a deity who could have existed apart from this or any other world. By saying, instead, that it belongs to the very nature of God to be in relation to a world, panentheism implies that, although our particular world is contingent (created), its most fundamental principles are necessary. Panentheism is surely a clear step above pantheism, and thus respecting the contingency of creation, so it simply can not be dismissed outright. Nevertheless, my concern is that it might still threaten to bind something onto the character of God that would impinge on God’s freedom. I will stand with Karl Barth, and later Thomas F. Torrance, on this one, suggesting that God’s internal relations, ontologically in terms of the relations between Father, Son and Spirit, do not necessarily require God to act in a certain way economically, in terms of how God relates to the created order, humanity, etc. For example, God is free to create, but He is free not to create as well. Nevertheless, you could say that because of God’s communal nature, it is perfectly consistent for him to create and be in relationship with the creature. It would be difficult to imagine that God would be content not to create. Perhaps this sounds like classic theism to you, but I would argue for a more dynamic concept of divine being. So while it is possible to argue for, let’s say vestiges of the Trinity to be found in other religious traditions, this is still entirely speculative, and that is being quite generous actually, even maybe too generous. It is more consistent to read Christian revelation in terms of Christ revealing to us NOT the Trinity as a “model” for understanding God but rather revealing to us the very name of God as Father, Son and Spirit. I really can not go much into further detail here, but I really do not vary much from Barth or Torrance on these questions regarding religious pluralism. I still think you might get farther with Keith Johnson than you would with me. I have not read Veli-Matti Kärkkäinen on Trinity and Religious Pluralism, but my guess is this work might come close to Johnson in engaging your questions from an evangelical perspective. At the risk of being too simplistic, but in an attempt to put this on the bottom shelf, I can hope for the possibility that God might act to save people beyond the church through some sort of life raft that has yet to be revealed in certainty, but for the purposes of assurance, we can only bank on the church, Biblically speaking, as the ark of salvation. P.S. I am just a computer geek now who went to seminary a few years ago, so just take what I say on the technical details with a grain of salt as I do not read on the subject regularly anymore. Clarke… Thanks for your gracious response to my postings. I’m not trying to “bind something onto the character of God,” but his nature must tend to something definite, even if we can only speculate on what that might be. Jesus did not say that he is the ONLY way, the ONLY truth, the ONLY life. The Bible says that there is no way to the Father, except through the Son, and implies that Jesus Christ will be the Supreme Judge of all human beings on ‘Judgment Day.’ However, it would only be fair if Christ shares that judgment seat with Muhammad or the Mahdi in the case of Muslims, Indra or Krishna for Hindus, Gautama or Maitreya for Buddhists, Lao-Tzu for Taoists, and so forth. Some just recognition is required. If you read the Preview on my website at http://www.religiouspluralism.ca, you will see that I am merely expanding on what is already inherent (but sometimes obscured or hidden) in the orthodox concept of the Trinity. Despite apparent differences, the underlying similarities among religions suggest the possibility that they may all be merely different facets of the same multi-dimensional reality. It is only common sense that the Trinity would reveal itself in three basic religious “attitudes to the Absolute.” Indeed, when we examine world religions, we see in the personalities they portray and the language they use, a reflection of one or other (or some combination) of the three divine psychological persona. I think that Genesis 1:26 (in the beginning), where God says “Let us make man in our image,” suggests that later on he might also have said, “Let us help humans make their religions in our image.” It would be quite natural if human religions reflect particular aspects of the threefold psychology of One God in Trinity expression. On the face of it, maybe God is telling us something about his multi-dimensional self, through the diversity of major religions, which can be seen to fall into three basic attitudes to or perspectives on the Divine. I’m not trying to “impinge on God’s freedom,” but rather to enlarge our comprehension of him. If you actually read my website, you will see that the wonderful multi-dimensional nature of One God is exalted not diminished in the Trinity expression given by the world’s major religions taken altogether. Samuel, thank you for being generous in your responses. I only wish I had more time to engage your ideas, which are very thought-provoking. So if I do not respond right away, I hope you might understand that. Also, please forgive me and correct me if I am making a judgment on your proposal which is not fair and misrepresents what you are saying. I sense your passion for the subject and I commend you in your concerns. For the sake of keeping this brief, let me just focus on one point that you assert: “Jesus did not say that he is the ONLY way, the ONLY truth, the ONLY life.” On what basis do you justify your interpretation of John 14:6? By inserting the “only” repeatedly into the verse, your argument implies that the definite article “the” carries no crucial force, and I am aware of no accomplished exegetical scholar of Scripture that would agree with your reading. How else can the words, “I am the way,” be understood if they do not affirm the centrality and uniqueness of Jesus Christ as being essential to Christian faith? I do not see any other way to get around this. But equally for you, a pluralistic theology that seeks to transcend the particularities of all of the major religions traditions appears to be just as exclusive. It is difficult to perhaps see this because of the language involved, but if, let’s say for the sake of the argument, that your reading of John 14:6 is correct, it would fly in the face of what Christians have believed for two thousand years. It would not merely relativize Christian faith. It would falsify it. Panikkar wants to take me down the river Ganges. This is surely better than being on the river Tiber, but I am sitting here still on the river Jordan. The problem that is faced by Panikkar, and presumably your thesis as well, is that we are all on different rivers. I can appreciate the desire to find some “riverless” river, but the exclusivist nature of the task makes this inherently problematic. Let me put the question to you from a different angle. You are suggesting that a trinitarian approach to pluralism would solve much of the difficulties that trouble us. But, correct me if I am wrong, the Hindu and Buddhist traditions are inherently monistic in orientation. Sure, you can find trinitarian symbols like the Hindu trimurti or the Buddhist trikaya, but these symbols are not essential to the Eastern philosophical traditions. Monism is foundational, is it not? If all is One and there is no distinction ultimately, then would not the trinity as you propose be considered nonsensical from a monistic point of view? You say, “Pluralism is the engagement not the abandonment of distinctions”. But how can this be synthesized with monism without losing the thrust of your proposal? I can imagine some Eastern philosopher looking at your trinitarian approach, saying “Well, this is all very nice, well and good,” only to then pick it up and drop it into ocean of the “Ultimate Reality” or “Nothingness” and attempt to dissolve it. What then becomes of your trinitarian model in the hands on the monist? This does not even address the problem with Islam which explicitly rejects the doctrine of the trinity as Christians understand it. As I see it, your trinitarian model not only has problems with Christianity, it also faces difficulties with the other major religious traditions as well. If I can be generous, you might have rightly found some “vestiges of the trinity” in various religious traditions, but it is puzzling to imagine how your thesis really makes for a solution that would be accepted by all parties involved. Though I admire your earnest endeavor, I seriously wonder how your proposal would overcome these incredible challenges. Clarke… Thanks again. You are such a skilled debater, that you force me to summarize my thoughts in ways I’ll be able to use on my website and in my draft book. However, you are merely deflecting attention from my point, which is that it would not be fair to the majority of people if Jesus is the ONLY judge. Do you disagree? You dismiss all the metaphysical logic and evidence I’ve cited as mere “vestiges” of the Trinity in other religions. However, if you look closely and consider the matter carefully, you will see that it is more than that. Yes, orthodox Christians may have to broaden their thinking a bit, but I’m not making this stuff up. Clearly, the diversity of world religions may very well be rooted in the diversity of the divine life itself. Thus, a deeper understanding of the Trinity might include a synthesis of all that God has revealed of himself, as contained in the wisdom of all the world’s major religions. If the threefold human soul – personality/mind/spirit – is modeled on the Trinity, then individual humans may inevitably have an innate predisposition to worship any one, any combination, or all of the persons of the Trinity. Some toleration is required. I don’t have to invent anything, because it is readily acknowledged that Allah, Abba or Father (as Jesus called Him), and Brahma are religious representations of the Creator. But the Creator is the first Absolute person of the Trinity of the thrice-personal One God. So, in at least one respect, we can say that a large portion of humankind apparently worship the same God – the Deity Absolute Creator – reflected in three world religions, i.e. : Islam, Christianity, and Hinduism. This pluralistic worldview becomes inclusive if you consider that Buddhism, Confucian-Taoism, Shinto, and some other major religions seem to be variations on the third Absolute, while certain others, e.g. Sikh and Baha’i, suggest combinations. The parallels between Christ and Krishna are well-documented elsewhere, so I won’t repeat them here. Suffice to say that a very strong argument can (and has) been made that the major religions of the world map directly onto the Trinity. However, any new idea has to be repeated many times before people will open to it. They read my words and they understand my meaning, but their conventional awareness doesn’t catch up with the full implications and validity of the idea until much later. By the way, my speculation on three snapshots of the Trinity at different ‘times’ or ‘ages’ of creation (existential, experiential, and absonite) addresses the question of the Economic versus Immanent Trinity (see my Preview pages 18-21). Like Clarke, I want to thank you for putting so much effort into dialoguing with us on Veracity, and for promoting your ideas with civility and such compassion. I do find them interesting and carefully reasoned. At base in your arguments there is the idea of ‘fairness’. Adherents to Christian Orthodoxy would argue that God is sovereign…and man is not. So the question of equity (fairness) becomes, “Should man meet God’s judgment, or should God be held up to man’s judgment?” Whether one accepts the Bible as the authoritative word of God or not, Christianity is unique in how it answers that question. Specifically, the all-powerful Deity provided a redemption plan through His own sacrifice. God played by His own rules at His own expense. Seems to me you can’t get any fairer than that. That’s also quite a standard for measuring love. Let’s assume for argument (and setting aside logical arguments such as the Law of Non-contradiction) that we accept the idea that there are these other paths to God as you posit. If that were true, then the sacrifice of God Himself on a Roman cross would have been at best just one more road to the deity, and not the supreme sacrifice and provision that Christians believe it to be. Logically speaking it would have been unnecessary, because it would have been incomplete–which would beg the question, “If that was really God on the cross, why couldn’t His sacrifice be enough?” Down goes Frazier! And down goes Christianity. We can’t have Christianity apart from its truth claims and still have it be Christianity. I can give you endless Scriptures, and I am sure you know them, that put it all on the Resurrection. There is a complete Gospel that goes with that Resurrection, and it does not lay out broad and parallel roads to the presence of God. Quite the opposite. As much as we may wish to be completely inclusive in our love for our fellow man, we don’t get to hold God up to our ideas of fairness. Again, thanks for the opportunity to exchange these ideas. All this intellectual banter is quite overwhelming to me. To my mind, Common Grace is the grace that is poured out upon ALL who are born into this earthly existence….the sun, the rain, the capacity for love, etc. Common Grace ends at the moment of physical death. It is then that Saving Grace comes into play. Our eternal address is determined by whether or not we have accepted the gift of ETERNAL SALVATION through the sacrifice of Our Lord, Jesus Christ. I believe that All will be given the opportunity to hear and accept the Gospel of Jesus Christ, regardless of what religious path was chosen in the brief span of physical life.This Saving Grace MUST be bestowed upon each and every one of us because no one comes to the Father but by Him (Jesus Christ). Of course, Our Father wants every one of us to return to the light of His Presence. I share with you your frustration over the myriad of opinions regarding common grace. But having at least some familiarity with the debate helps us to understand why different Christians view the topic of grace in general differently. The bottom line is there is a difference between a type of grace, that you speak of, that is common to all, believer and non-believer alike, versus a saving grace, that is uniquely given to Christian believers. Christians do debate over the particulars, but the source of both common and saving grace is the same, the One and Only Lord Jesus Christ! Thank you for commenting at Veracity.